Yesterday, I recieved these gorgeous pieces of jewellery from the lovely Emma at Ji Ji Kiki, which is an adorable, affordable online boutique that sells all kinds of kitsch, vintage inspired jewellery, clothing and accessories. Emma very kindly sent me three items, which I was absolutely thrilled about! The Antique Silver Blossom Branch Necklace is just gorgeous, it's so simple and delicate, and yet I've never seen anything like this before, it's easily one of the most unusual and gorgeous pieces of jewellery I now own! The Tiny Strawberry Necklace is just adorable and definitely something that will look amazing with almost any outfit and I am in love with the Cosmic Glitter Galaxy Earrings, they're so unique! They're statement earrings without having to weigh down your earlobes! I am so happy with all the pieces I received from Emma and I love the website so much! Here are a few more items from the website that I have my eye on! Thanks once again to Emma for sending me these gorgeous pieces! 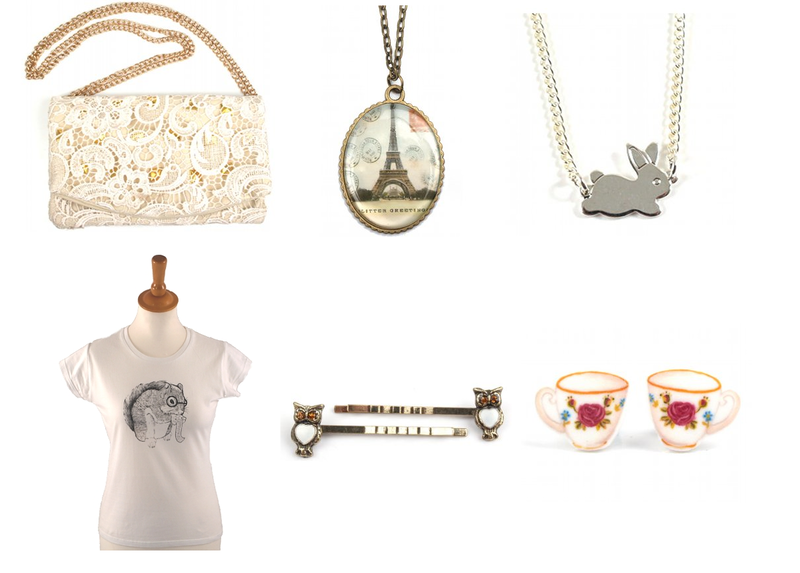 I just love the bunny rabbit necklace and the branch one that you received!